Ian Holloway hasn’t picked a consistent eleven all season. This is a light-hearted look at why that might be the case and why it’s not just a case of picking the best players. Picking the best team from a squad of players is no easy task. If it was a simple task of listing the best players then that could lead to several complications. If that’s not the best starting point then what might be a good place to begin in a quest to find the ‘best’ starting eleven? How about understanding the way the player naturally orients himself on the field of play? This can be a very eye-opening exercise. This takes in to account their approach, mentality and where they thrive on the pitch. Obviously the final team selection takes in to many other facets such as the opponent and game objectives. 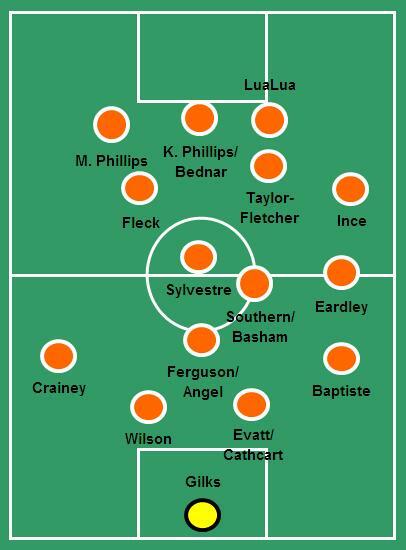 The diagram below takes (entirely subjectively) a view on where each Blackpool player is naturally drawn to and excels. This gives us our starting point. This paints an interesting picture and starts to show where Blackpool may be lacking. There are obvious points for debate based on the subjectivity at hand. For example, Ian Evatt generally lines up in the left centre back position and here he has been placed at right centre back. Arguably his one footedness doesn’t help him on the left and his more natural position should be on the right. Neal Eardley is placed much higher up the field than his right back role, mainly because he shows more of the traits of a wide midfielder than an orthodox full back. Even though they are different players both Kevin Phillips and Roman Bednar appear to enjoy the role of centre forward, not that they can’t play together, but they do like to occupy some of the same spaces. Gary Taylor-Fletcher always appears to drop in behind the striker when he starts as a forward and even when given a midfield role he drifts high up the field. Lomano LuaLua has been placed very high up the pitch; this is the area where he looks most comfortable. It might seem a little pointless just dropping the players on to a pitch diagram, however, that arguably gives a starting base to select the best eleven. The next logical step might be to now play fantasy football and just pick the eleven best players giving bias to the 4-3-3 scheme used by Ian Holloway. The diagram below illustrates these subjective picks. There are reasons for going with certain players here. 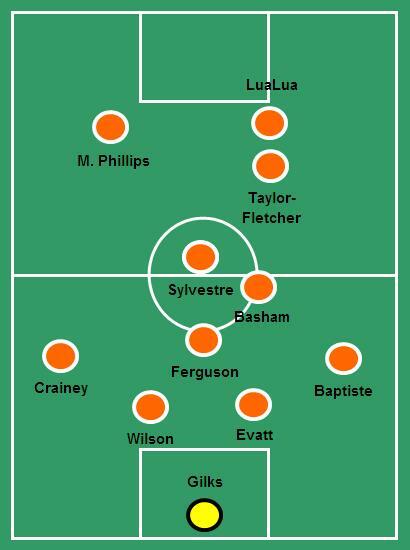 The centre back positions are a constant source for debate at Blackpool. The selection of Wilson and Evatt is merely a nod to the former being the best covering defender and Evatt the best positional stopper for want of better terminology. Alex Baptiste is kept at right back as he remains the best right back on the books and his positional ability is still a little questionable for the centre positions. In midfield, the trio of Barry Ferguson, Ludovic Sylvestre and Chris Basham get the nod. Basham’s technical ability gives him the edge over Keith Southern. Up front, Taylor-Fletcher as a creative force and goalscorer gets the selection alongside Matthew Phillips and LuaLua. Of course this is all entirely debatable decision-making, but it hopefully it starts to illustrate the difficult task of trying to select a best eleven. The next consideration is balance, as the diagram above shows how awkward that line up is in reality. 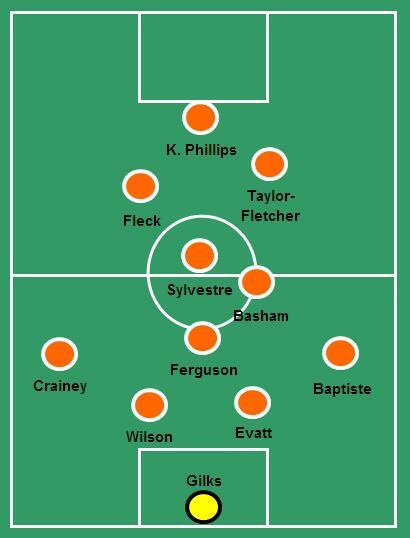 The diagram below adds some balance between left and right, attack and defence to give another attempt at the best Blackpool eleven. The key movers here are John Fleck and Kevin Phillips. Essentially the reasons for their inclusion now is to shift the team to the left a little more hopefully to give them better balance in their point of attack between left, right and centre. John Fleck is an interesting inclusion at this point; arguably he is the most natural left-sided attacking player. Although he has rarely played in his natural role whilst at Blackpool, where he is positioned here is potentially his optimum position. It is where he would excel with his ability to pick a pass and shoot on sight. For the sake of formation this is a kind of 4-3-3 of sorts, but woefully lacking width. There are clear issues of balance within this Blackpool squad whilst there are excellent options with the players at hand. It does serve to illustrate why Holloway may be moving away from his trusty 4-3-3. Fielding a midfield three lacks balance due to the lack of left-sided midfielders in the squad. Sylvestre is very right footed and will always gravitate to that side. Fielding two deeper midfielders eases the selection issue for Ian Holloway but still gives his issues with finding the right blend up front with few combinations giving him width, pace and creativity as well as pure finishing ability. This is just a very simple look at how to choose a best eleven without even weighing in the other considerable factors. Making these decisions is at the core of the manager’s role and as Ian Holloway has found the right blend in the past, there’s no reason he can’t right now. Blackpool fans everywhere will hope he has asked and answered all the pertinent questions to lead the Tangerines to a strong end of season and back to the Premier League. What is wrong with Blackpool? Upon reading interviews with football managers more often than not they reveal elements of what makes a successful team. Before talking about their playing philosophy, they often talk about the importance of creating the right team spirit or the right energy around the team. Essentially … Continue reading What is wrong with Blackpool?